Just a little sunday post. I really need to post more don’t you think? What would you like me to post here on my blog? Just leave a comment and i’ll pick out some nice subjects! But now Mugcakes & Pancakes, yes please! I love to make mugcakes or pancakes because they are easy and freakin’ delicious. 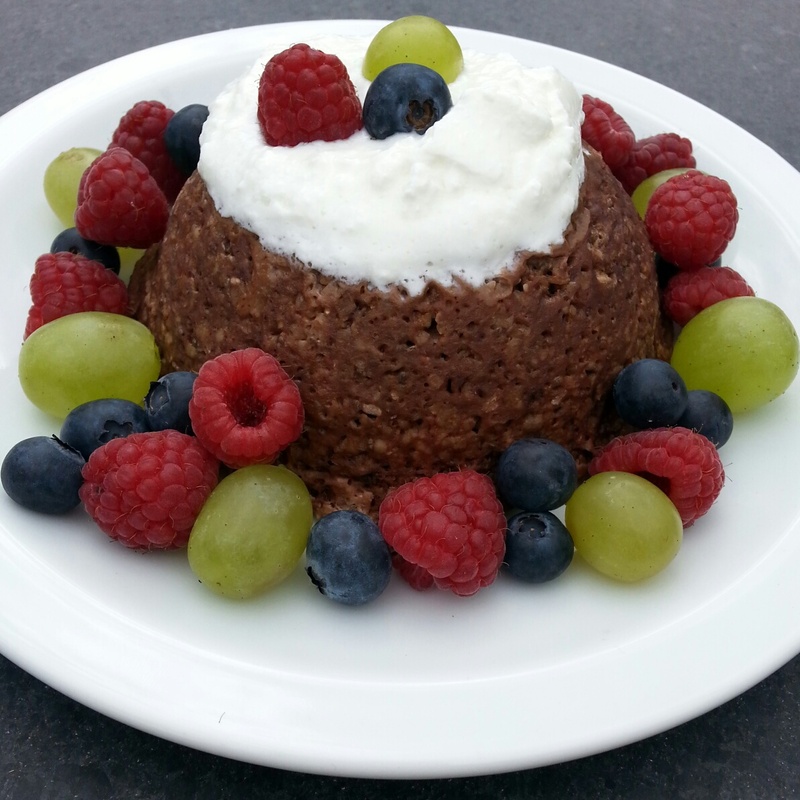 So here is a little post where i share kind of a recipe. There is no actual recipe, you can add or leave whatever you want. 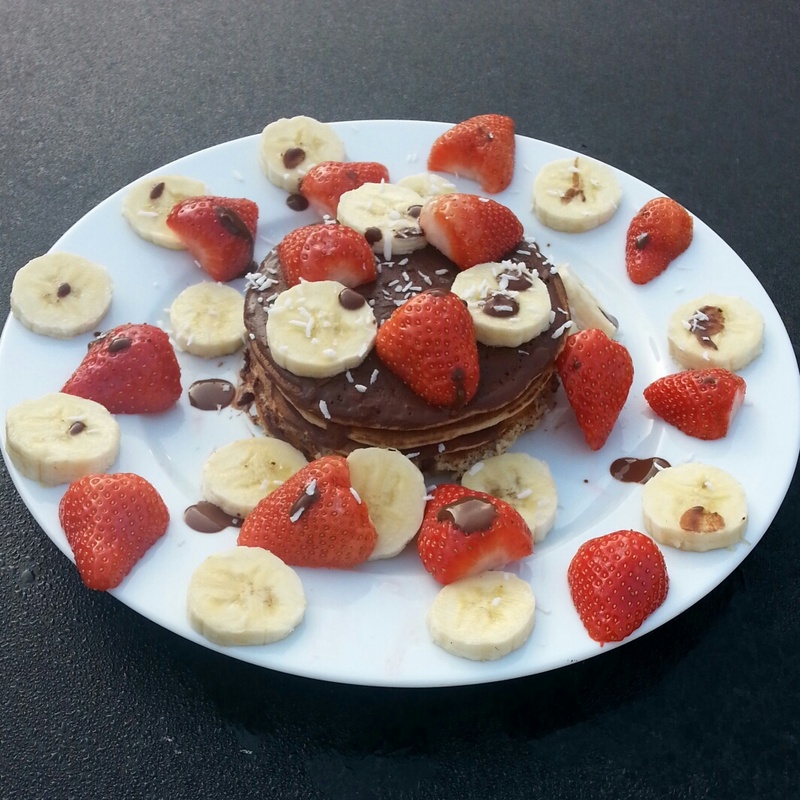 In this post i will show you what i did and how i make my pancakes or mugcakes. Well at first, what is a mugcake? A mugcake is a little cake, made in a mug.. Simple isn’t it haha! Ik made a few of them and they all tasted freakin’ good. 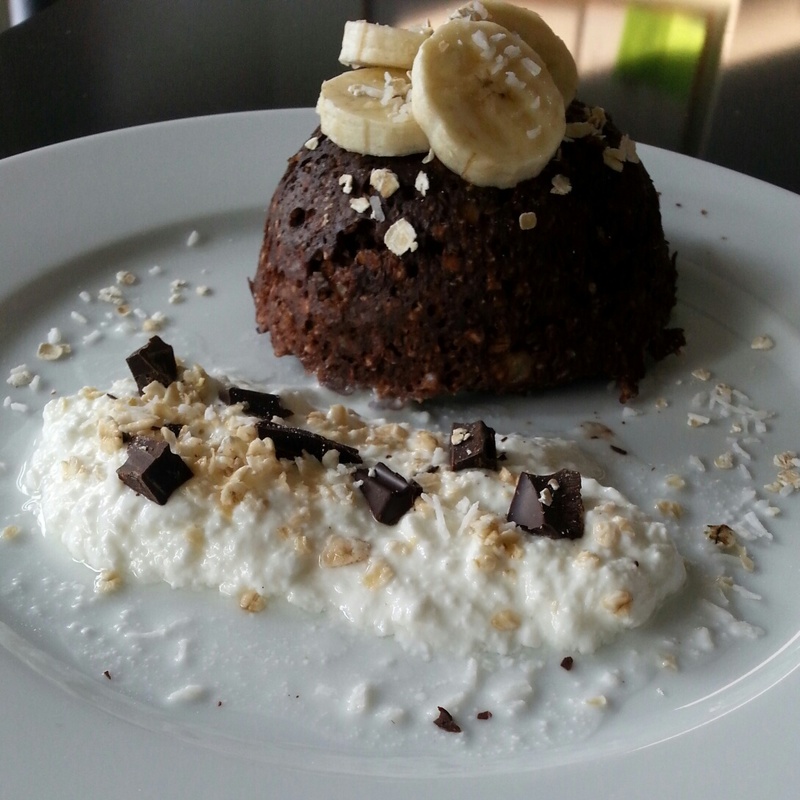 1 banana, 1 egg, 4 tablespoons oats, 1 tablespoon raw cacao powder, 1/2 tablespoon chiaseeds, 1/2 tablespoon coconut flakes. Cut the banana into very small, tiny, little pieces. No slices, just veeeeeeeery small pieces. Put the banana in a mug (i used a round cappuccino mug) and add the further ingredients. Mix it all together. Don’t blend it, just mix it. Put it in the microwave at 1000 watt for 2 minutes. Turn the mug around at a plate and wait until the cake falls out of the mug. Top it with whatever you like! I didn’t use almond milk on this one, because the banana is enough. So if you add a banana, you don’t have to use almond milk. Feel free to add it anyways if you like it! 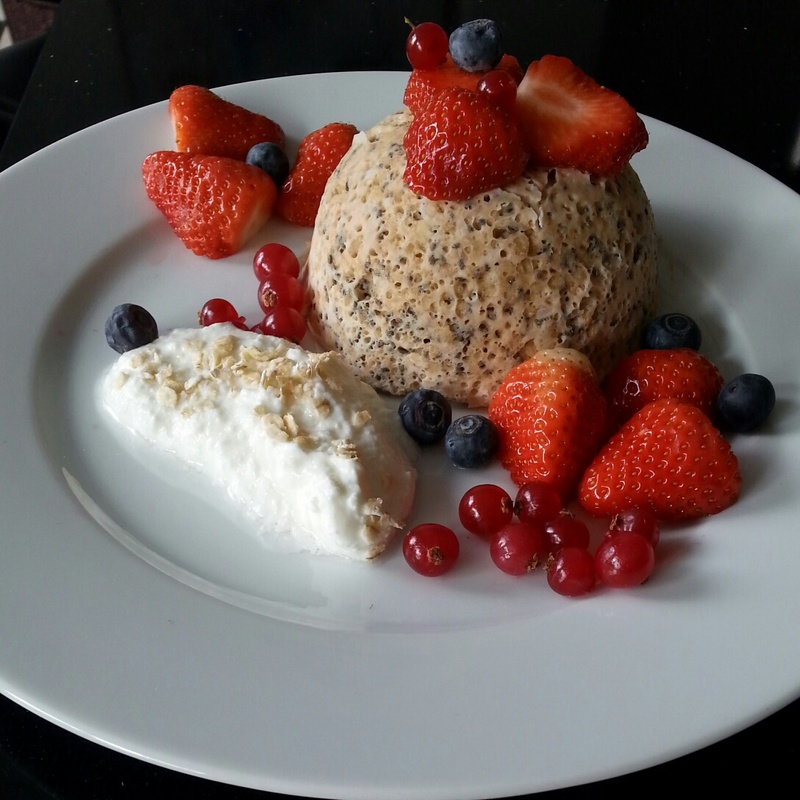 1 egg, 4 tablespoons oats, 30 grams strawberry protein, 2 tablespoons almondmilk, 1/2 tablespoon chiaseeds, 1/2 tablespoon coconut flakes. This one is a bit easier then the Chocolate banana, because you have less ingredients. Just mix it all together. Don’t blend it, just mix it. Put it in the microwave at 1000 watt for 2 minutes. I did use almond milk on this one, because there is no banana involved. Of course you can change the strawberry protein powder for another flavor! 1 egg, 6 tablespoons oats, 1 tablespoon strawberry protein, 1 tablespoon raw cacao powder, 3 tablespoons almondmilk, 1/2 tablespoon chiaseeds, 1/2 tablespoon coconut flakes. Also a easy one! This one was a bit bigger, 6 tablespoons oats instead of 4. So that means you have to use more almond milk! Easy right? Just try it out some times and let me know if you did! PANCAKESSS! 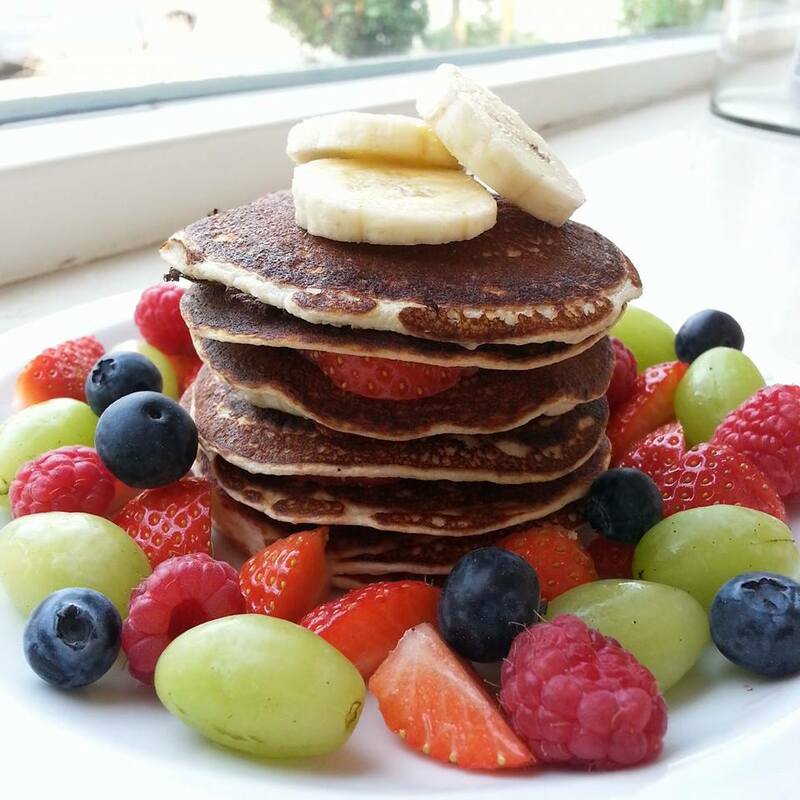 We all love protein pancakes. At first i always thought it was so hard to make these, but i found a recipe that is so simple, even my younger brother could make it.. if i had a younger brother. Ha-ha. Sorry, silly joke. But i always use the basic recipe. So you will see a few pics of pancakes i made, and the recipe is always the same, except for the bottom two. 1 banana, 2 eggs, 3 tablespoons oats. Yes. It really is this easy. Just put all of the ingredients into the blender and blend it all together. Heat a little pan and some coconut oil. Not too hot, because your pancakes will burn! Make some small and cutie pancakes! Flip them over when the top is getting a bit bubbly. Be patient. If you’re pancakes are not done, they will fall apart. So make sure that every side has a nice and brown color. Top them with some nice and delicious fruits. 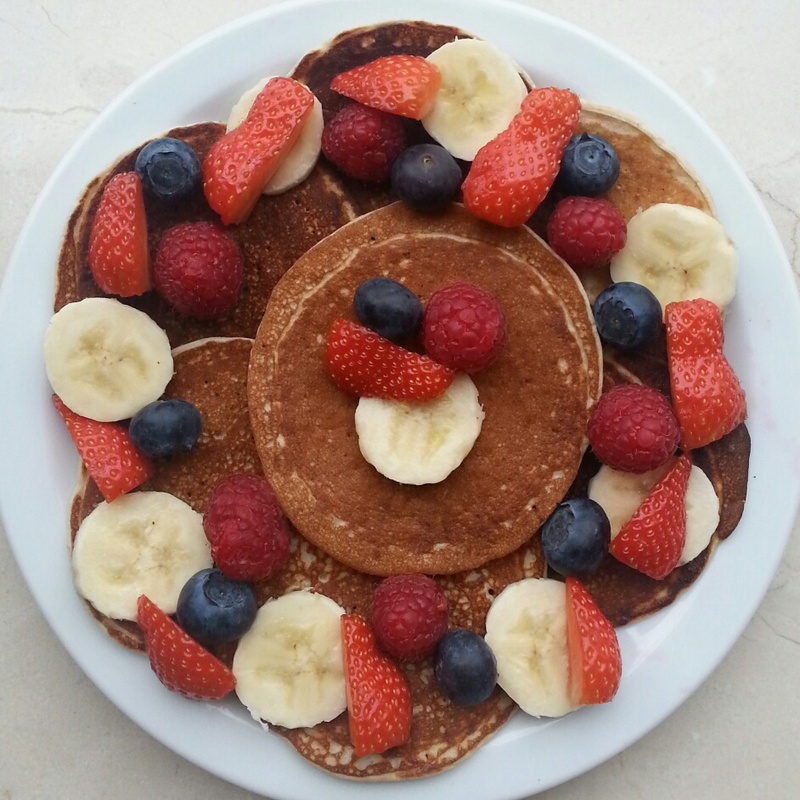 Pancakes: 2 egg whites, 1/2 banana, 2 tablespoons oats, 2 tablespoons Vanilla protein powder. Well, just as the pancakes above. Use the blender! 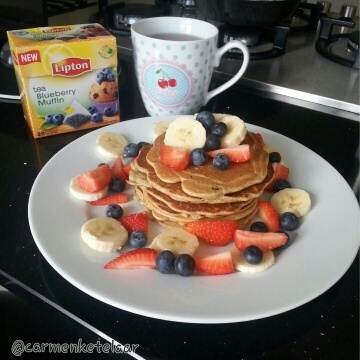 Mix all the ingredients together and bake the pancakes in a pan with heated coconut oil. Cute and small. That’s the secret! Pancakes: 3 eggs, 2 tablespoons almond flour. Chocolate sauce: 1 tablespoon raw cacao powder, 2 tablespoons almond milk. Mix the eggs and the almond flour together. Heat a pan and some coconut oil. Don’t make the pan too hot because your pancakes will burn. Make some cute and small pancakes. Flip them over if the upper side is a bit bubbly. Be patient. The pancakes need to have a nice, brown color. Top them with whatever you like! The chocolate sauce is really easy to make. Just mix the almond milk and the raw cacao powder and keep stirring until the structure is nice and thick. For a bigger recipe of the beneath pancakes; Click Here! Just give it a try and you will see that it tastes sooooo freakin’ good! Hm dat ziet er heerlijk uit! Ik moet nog steeds je bananenbrood proberen, nog geen tijd gehad! Ga het snel doen!